May is a month full of reasons to celebrate. Between Mother’s Day, Family Wellness Month, and National Physical Fitness & Sports Month, we couldn’t decide which holiday deserved the most attention. 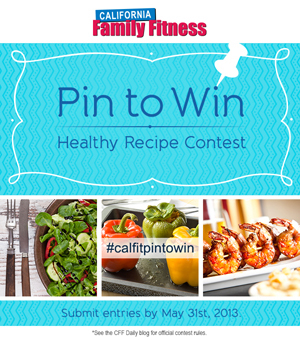 So we’re celebrating them all in a big way with a Pin to Win Healthy Recipe Contest in honor of health, fitness, and all things family. Follow California Family Fitness on Pinterest. Fill up your new board with all your favorite healthy recipe pins. Must Pin a minimum of 3 recipes in addition to the blog post about the contest. Pin this blog post about the contest. Three lucky winners will be chosen at random to receive 1 month free*, 30 days of unlimited Body Fit training and a $50 California Family Fitness gift card. The contest starts Friday, May 17th, and all entries must be submitted by Friday, May 31st at 12 PM PST. Don’t miss your chance to show off how many amazing healthy recipes you can find and pin! *1 Month Free Membership is for an Individual Membership Only. If the Winner is a Current California Family Fitness Member, the winner's account will be credited the amount equal to 1 month Individual membership.